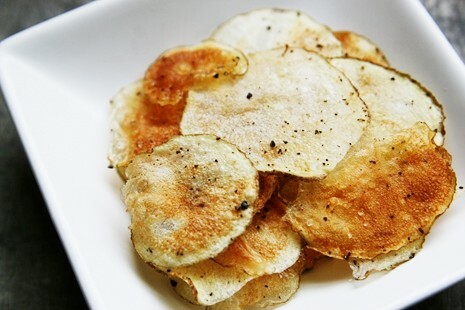 Home » Other » How To Make Potato Chips In The Microwave ? How To Make Potato Chips In The Microwave ? 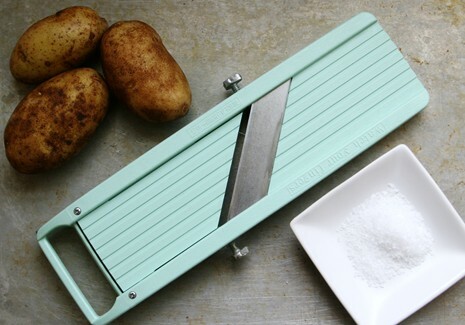 You will need a Mandoline to cut the potatoes paper thin. If you don’t have one you can try using a vegetable peeler. If you don’t have either, you’re out of luck (or you could try to slice it very thinly with a knife). Also, cooking one batch doesn’t yield that many chips, but its a great snack-sized amount for 1 person. If you’re up for a fun project and have a potato laying around, why not make some homemade potato chips? Or if you’re like me and need to pack a snack for your kids lunch, voila! <– You’re the hero of the day! Enjoy! Cut a piece of parchment paper to fit the inside of your microwave. 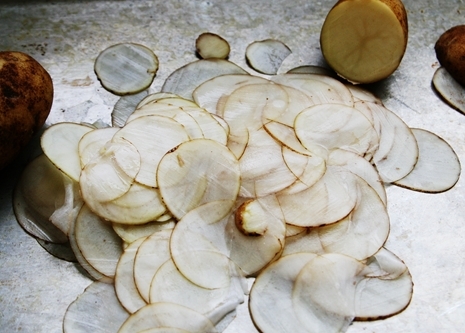 Carefully slice1/3 of a potato into paper thin slices using a mandoline. You don’t want to cut any more than this because any extra slices laying around waiting to be cooked will turn pink in color. 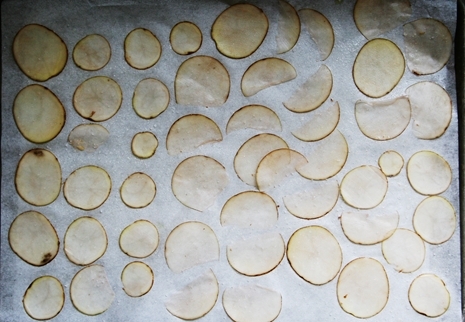 Completely coat the parchment paper with non-stick spray and place the potato slices in a single layer. Spray the potato slices with non stick spray and lightly sprinkle with salt and pepper. Turn off the rotating option on your microwave and cook for 4-5 minutes. Cooking times will vary based on the strength and power of your microwave. Some chips may turn very dark brown. Ideally you want them light and golden. Also in my microwave some of the chips on the outside layer didn’t cook as quick as the ones towards the middle, so you may need to remove the ones in the middle and cook the outer ones for an additional minute. Repeat the process until you’ve used your entire potato. Enjoy!